Personally Meaningful Projects - Crafting with Code 2.5 — Wonderful Idea Co. The last two days of crafting with code summer camp gave tinkerers a chance to return to tools and materials that they explored over the course of the week and explore personally meaningful projects. We've been experimenting with the weekly transiton from guided activities to self-directed, open ended projects and on thursday morning we started with a brainstorming session to generate ideas. We ended up with 7-8 possible projects within the design parameters of being interactive, combining digital and physical world and able to be accomplished with the time and materials available. Campers divided into groups which ranged from 2-6 people depending on the complexity of the project. We allowed some tinkerers to work on their own, but everyone had someone that they could collaborate with to meet their goals. On Thursday we had the whole day to practice using new tools, refine chibitronics code and plan out their idea. 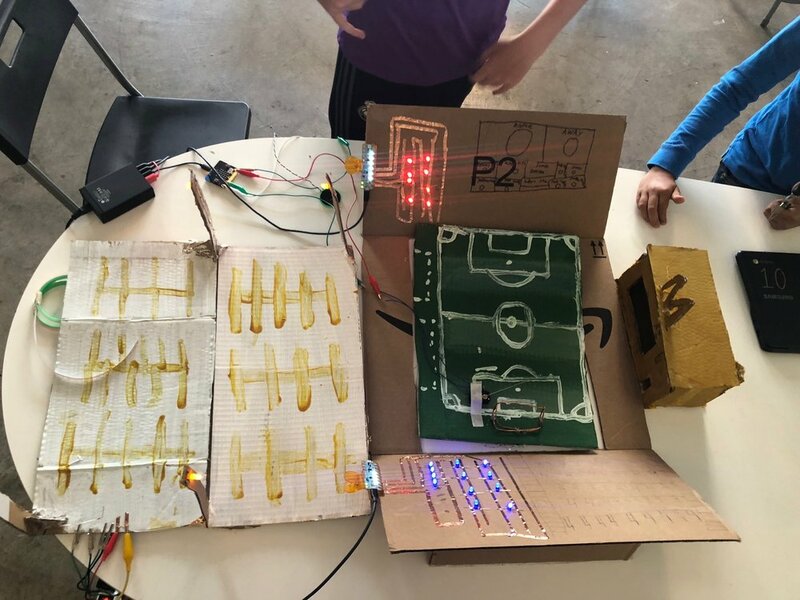 The group projects included a light up pathway, soccer stadium, coin operated vending machine, smart house, digital campfire, and rgb LED glasses. The next morning, campers jumped right back into their projects without us having to remind them to get to work. There were lots of interesting ideas taking shape across the room and we bounced around offering materials and ideas to the groups. One of the most complicated projects was a giant soccer stadium constructed by six campers. They divided into three groups to work on the field complete with a goal that played a melody when a goal was scored, the stands with pulsing programmed lights and building a parking lot and McDonalds for after the game eats. Two campers worked on a campfire scene with a series of lights programmed to mimic a lifelike fire. They also built a couple of LED marshmallows to go with the playful installation. One idea that had been percolating since last week was a vending machine for squishy toys. This project incorporated many complicated elements including a coin switch, a motor to release the prizes and green/red lights to let you know how the machine is working. Although they didn't finish the design in the time allotten, we were impressed by so many awesome ideas that they explored. The group working on a mini house had such amazing detail in the artistic elements but they also had lots of explorations with programming and engineering. Not only did they create realistic furniture, decorations and assecories, they gained proficiency soldering LEDS and debugging problems with their code. The light-up walkway was another great example of collaboration. One of the campers spent their time laying out the LED traces, soldering the components and constructing the cardboard constructions while their partner figured out how to program pressure sensitve switch to trigger the light levels to change with footstep switches. At the end of the day the group shared projects with each other before opening the doors to parents, siblings and friends. It was so awesome to see the progress that the groups made over the course of a relatively short time and it was even better to reflect on the collaboration, playful spirit and intentionality that infused each of the groups work. 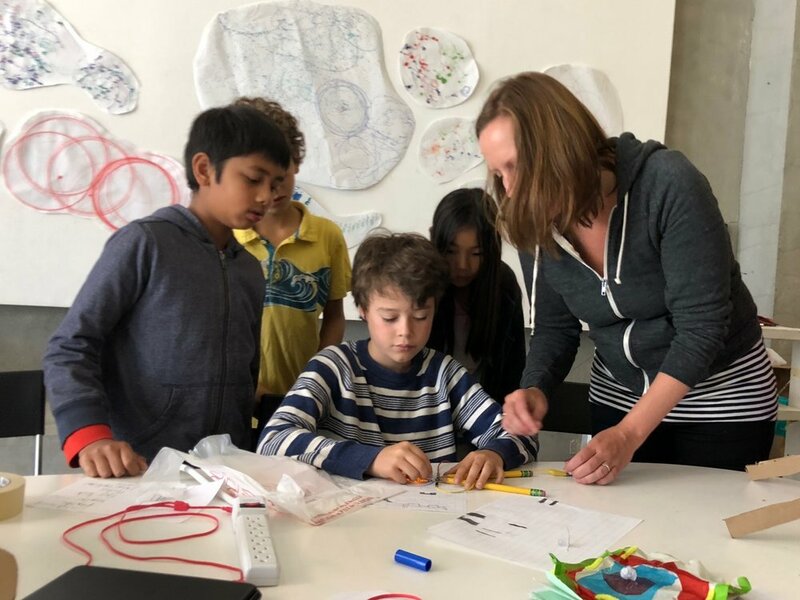 We're taking a two week break from summer camp for scratch conference at MIT and to reset for our PD workshop, but really looking forward to round two of this prototype program in the beginning of August!